0.03 l.m. of textual records. 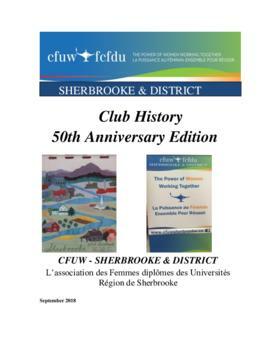 The series contains primary source material on the history and administration of the Sherbrooke and District University Women's Club. It consists of certificates, constitutions and by-laws, reports, news clippings, speeches, correspondence and advertisement. It is comprised of the following files: History (1975-2018), Constitution and Charter (1968-2003) and Anniversaries (1993-2008).